It’s just incredible to see when people have passion for what they do. It can be seen miles away. In last couple of weeks I’ve communicated with 2 such people – I asked advice from them about areas of their expertise. 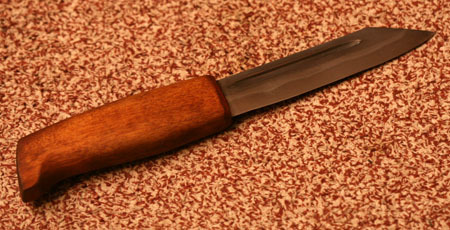 One of them was guy with nickname Old Bear, a blacksmith who makes just amazing fixed blade knives. 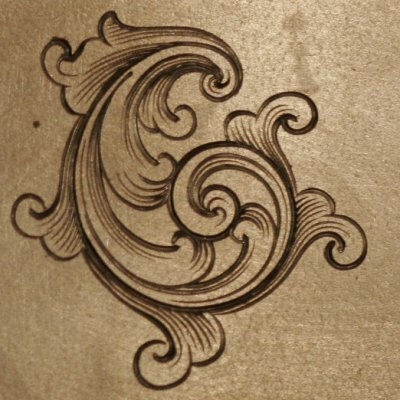 The other was master engraver Sam Alfano. Old Bear I found in one local LARP internet forum, which I somehow happened to read, where he very kindly answered all kinds of questions about how to make knifes, swords and other stuff. So one day I wrote him long email with all kinds of question and he answered that to write answers to all those questions would take just too long time. So he invited me to visit him at his work (he is a Major in some kind of military trainings school, how cool is that?). I of course accepted the invitation. When I went there he introduced himself as “Hi, I’m Old Bear, fat and ugly!”, which shows just how cool his sense of humor is. I guess we chatted about 3-4 hours there and I came back loaded with extremely useful information. It was just amazing how helpful he is and how he just wants to help beginners expecting nothing back. If one would do something just for money there is no way he’d want to help others just for free. Here are few of his knives, just to show his original style. And here is one with damascus blade. Second guy I talked about was Sam Alfano, he created engraving forum called iGraver.com. In that forum I asked some newbie questions about engraving and he was kind enough to send me some free engravers, DVD video how to sharpen engravers and 5x5cm practice plate, which he had engraved with some samples how real engraving should look like. And truth to be told, it looks really-really amazing. Now this scroll is about 2x2cm (about 1x1in for metrically challenged). The exiting thing is that I have a chance to take Basic engraving class from Sam in July, which is held in Belgium. I bet it will be fun and very informative. Last week passed very quickly. I mean really-really quickly. This happens when you do something you really like – you just get lost in the process and forget about yourself and world. Your mind is focused on the very thing you are doing. You are not checking your 3 email accounts after every 10 minutes to see if someone wrote you and you don’t check Google Reader to check out if any of the 20 blogs you’ve subscribed to has some new posts. And if something new accidentally pops up, then it’s even better excuse not to work and read it. This happened to me very often when my job was boring. For some reason I just couldn’t find the excitement in programming anymore. Of course there are still many things/areas I want to learn in programming, but this can’t happen in some government office job. Last week passed very quickly. We are getting very close to finishing our first bigger batch of practice swords. 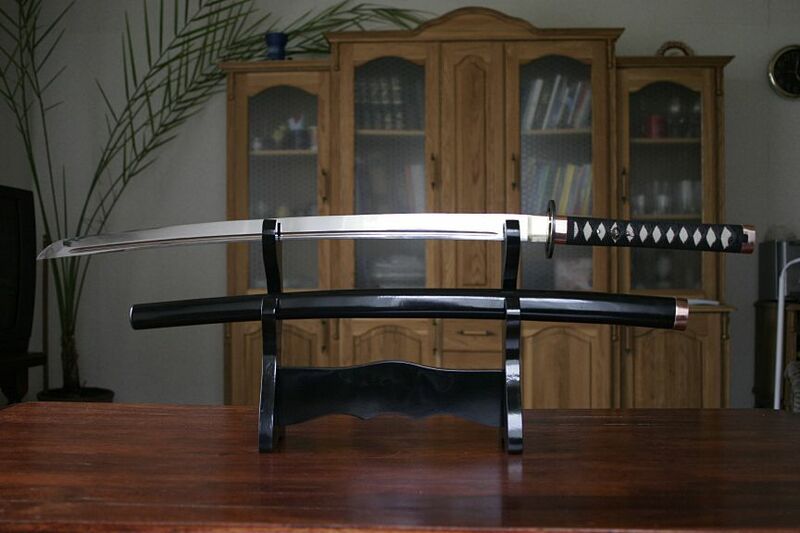 They’re katanas. 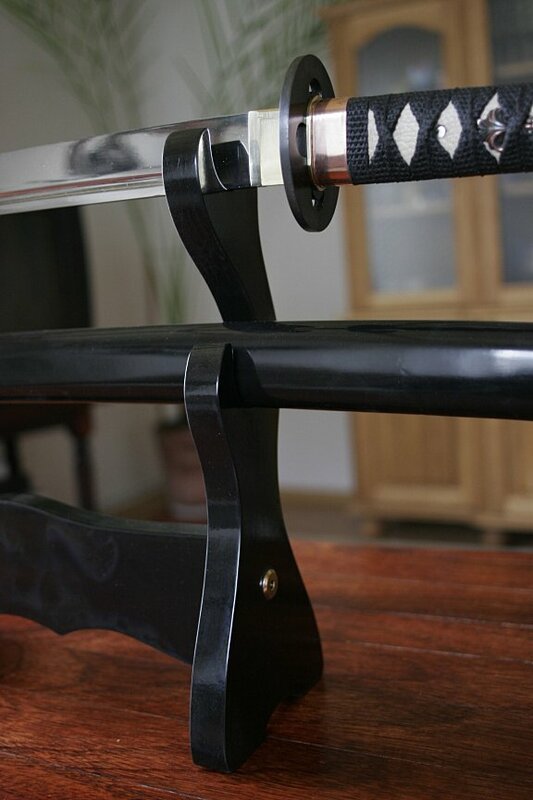 They’re practice swords for us (we practice the making) and for clients (they practice some kind of sword art). 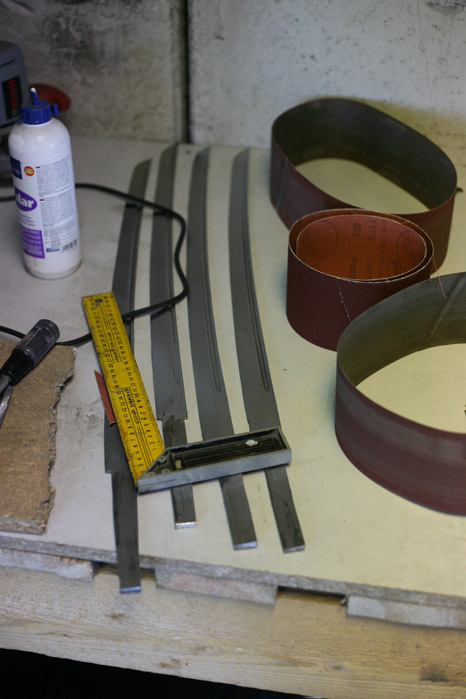 In the beginning of week we finished the blade sanding – now they’re sanded with 150 grit paper. After that we started to make all those little details that go with sword. There are about 5 copper details to make and some of them require soldering together. So all in all about 50 pieces to cut out, solder, sand and polish to mirror finish. I hope they’ll be finished in a week or two. Then I’ll post some photos here too. In the mean time my father made two knives to find out how 2 processes work. 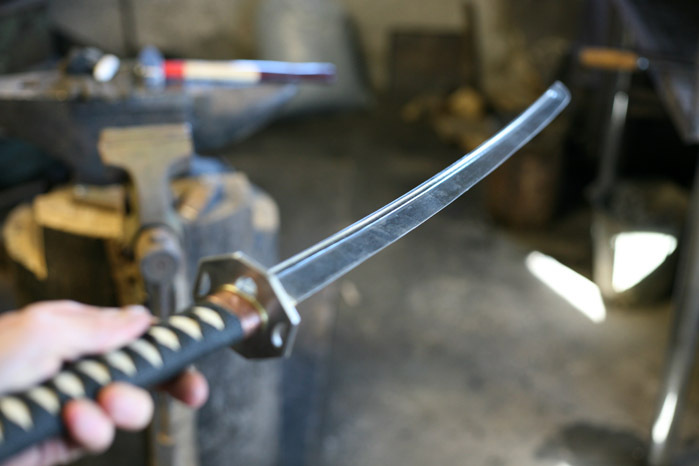 First is pattern welding (also called Damascus) and second is temperline creating (called hamon in Japanese sword). Good thing is that these processes are actually very simple (once you know how to do it). 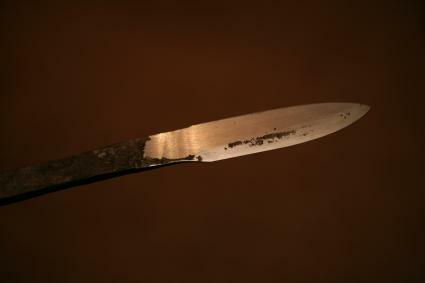 This is the temperline knife. Blade length is 11cm. 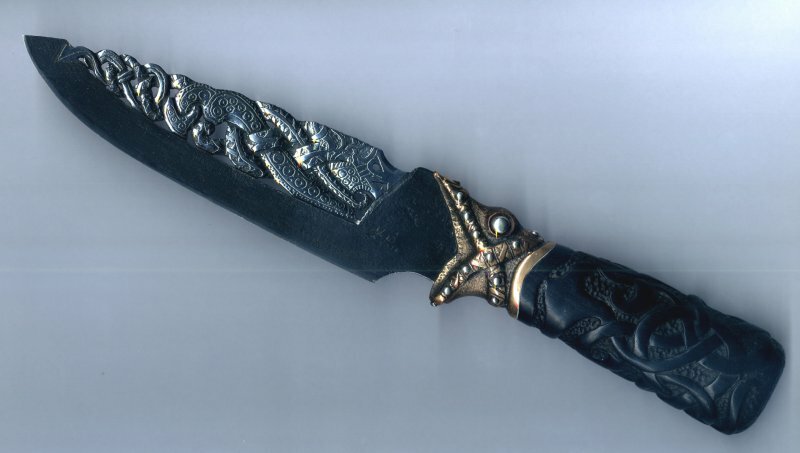 This is Damascus blade. Blade length is 7cm. 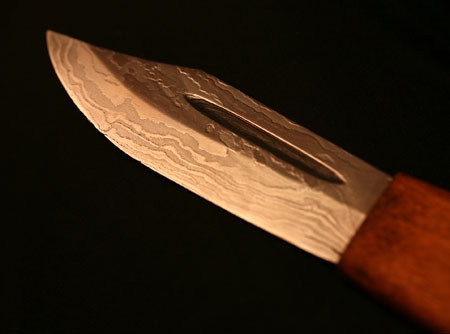 And here is big closeup of Damascus blade tip. Different layers of metal are nicely seen, there should be about 30 layers. One thing I really like about this blacksmithing is that there seems to be just endless opportunities to learn something new. Just like with computers. When you’re programmer and doing some larger projects on your own, or even with team, there are many levels of abstraction that you have to keep in your head and figure out how to solve different tasks at different levels. Say you want to build e-commerce site. If you’re on your own, then you’ll install server (linux, *bsd, solars? ), you must choose DB (postgres, mysql, sqlite, oracle? ), programming language, templating language. You must think how incoming http request is routed inside your system, where is authorization, where, when and how data is asked from DB, at the lowest level you must decide which algorithms to use and so on and so forth. You are server admin, DB admin, programmer, user support and secretary. You know the drill. Yesterday I had some spare time (we’re doing our first batch of katanas right now, so this takes majority of my time) and I used it to practice forge welding – success was 3 out of 4 tries. And to practice my hammering skills I made this in half an hour, or thereabouts. This second image is from series ‘before and after’. Here you can see how out of nothing something can be made. Fascinating. 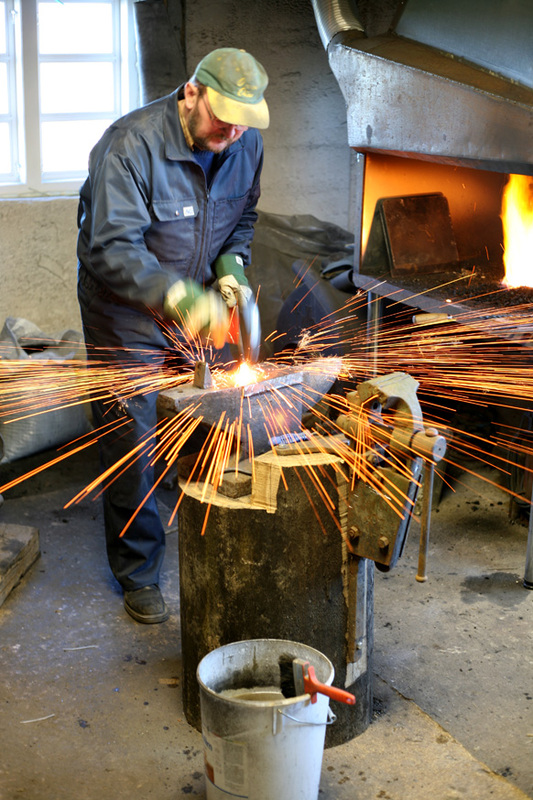 One of the required skills for blacksmith is forge welding. 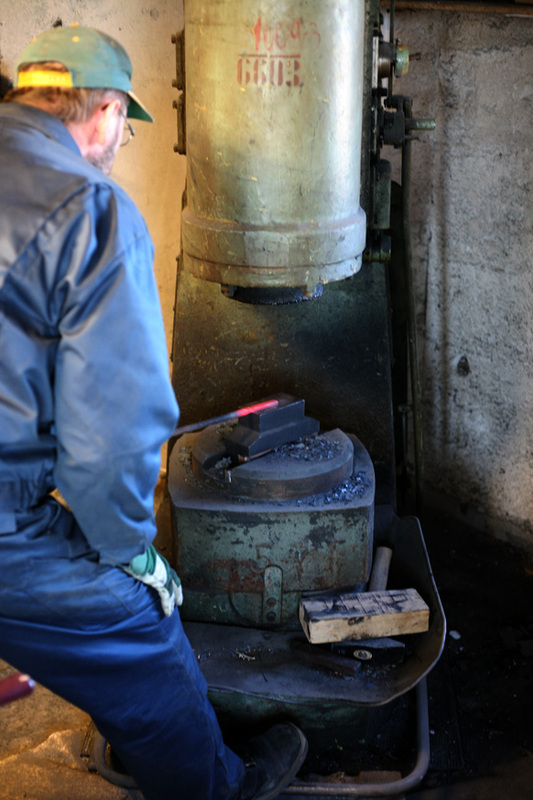 This is also basic skill for making pattern weld, also known as Damascus steel. Basically you take two pieces of steel/iron make them very-very hot, when they almost melt, beat them together. In the end you’ll have just one piece of metal. When we first tried to do this we just couldn’t get the pieces to stick together. Maximum of 2mm was welded, no more. And there was no way to know what was wrong. Too cold? Too little flux? Mouth too open, or what? As it turned out the old coal was crap. Two days ago we bought almost 1 ton of ‘special’ blacksmith coal (it burns much cleaner, no smoke and that ‘romantic’ sulfur smell) and with it the welding just works. Oh what a great feeling it was when the first piece stuck together! Here’s a picture how forge welded piece of steel is really one piece. No welding lines or anything. Perfectly one piece. To practice my hammer skills I made a knife blade out of this piece. 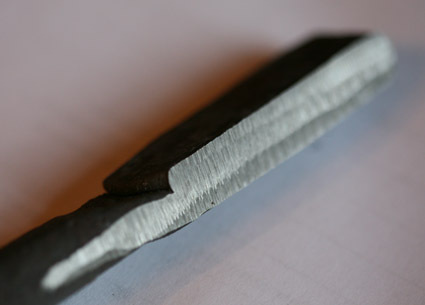 But as the steel was low carbon it didn’t harden enough, so the blade is no good for usage. Today afternoon my father made a 32 layer Damascus knife. After it’s polished and etched we’ll see what comes of it. 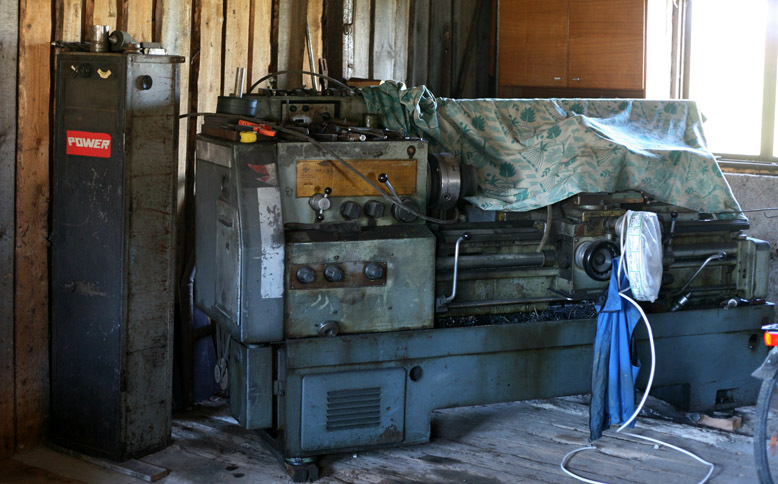 For the last month or so we’ve set up our workshop. And it amazes me every time we have to buy something just how much stuff you need to set up one normal workshop. With programming it’s easy. You buy computer for $1000 US, install linux and bunch of free programs and you’re ready to go. There’s not much you need to pay for on regular basis besides Internet connection, if you work from home. I mean, even brand new anvil alone costs 3 times as much. Of course no one says you have to buy everything new, but you get the idea. Besides buying all that stuff you need to build lots of custom things, for which you again need tools like arc welder and many-many more. Ok enough of that. And here is our first successful forge weld in process, and yes, it really does spit out all these sparks. It looks nice, but it also can give you a new meaning of hot. This blog will describe one man’s journey from being a professional programmer to becoming a blacksmith. How it came to be, why it came to be and how I progress in this profession. Will I succeed or will I go back to my comfortable computer chair and sweet little cubicle with 8 levels managers on top of me in 6 months – that is the question to which future will give answer. Little background. I started to study computers in 1995 at technical school. In 1998 I started to work as a technician after school – building PC’s, troubleshooting Windows problems etc. At that time I also became interested in Linux. Next job was user support and admin assistant in one TV station, which went bankrupt few years later after I left. After that came web programmer in one little company. There I became leading developer after some time. Mostly we used Apache/mod_perl/Embperl/MySQL (later we switched to PostgreSQL) for developing websites. In 2003 summer I went to army, where I served for 7 months, instead of the required 11, because I had kidney surgery so they released me after that (that New Year’s Eve I spent alone in hospital drinking fanta and watching fireworks, how cool is that?). From 2004-2006 I worked in Estonia’s biggest telco. There I mostly programmed in perl and did all kinds of stuff from web-sites to MPEG video stream parsing (one of the most interesting projects I’ve done). In that time period I also became interested in lisp, thanks to Paul Graham’s essays and Eric Raymond’s “How to become a hacker” which says: “LISP is worth learning for a different reason — the profound enlightenment experience you will have when you finally get it.” – I got it enough to start liking it a lot. Then came the government job. I let one guy talk me in to it. It was from 2006 to 2007. It was Java. It was Enterprise. It was editing 7 different java source files to change one SQL query. It was filling 2 forms with 7 signatures to get one day off. It wasn’t too much stress. It was good salary. I didn’t enjoy it. They offered me lots of money. I quit. Then came 3 months working from home doing perl web development (it ended at 16th of March at 11:36). I got to choose how much I did, what I did and when I did it. This kept my skin warm, but still not much enjoyment. This also gave me time to think about life in general and what I want out of it. I don’t need lots of money to enjoy life, I need to learn to enjoy basic things in life – spending time with people I love, talking, listening, being alone, food, wine, running, movies and so on. 7+ years of working daily behind the computer made me realize that I don’t want to do this for the rest of my life. I’ve always been good at doing ‘stuff’ and enjoying it too, this could be an alternative. I want to live in country. City has its perks, but I’m not made for citylife. There’s just too much stress, noise and people in the city. And besides, isn’t 12 years in the city already enough? Which is better – while eating breakfast you see from your window other houses and busy city traffic with big trucks and lots of noise or see pack of wild goats also eat their breakfast near woods, running around and enjoying life? I think Universe had perfect timing for me. 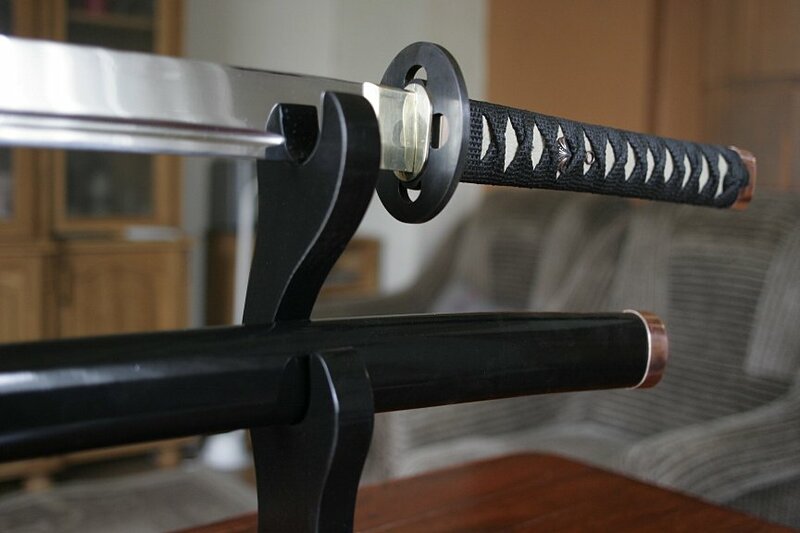 Just a little while ago my father rented out his company and started to make Japanese style swords as a hobby. He was also sick and tired of running the company just as I was sick and tired of working for others. He already had from good ol’ times lots of hardware needed for metal work. So he build a coal forge, bought an anvil and a good hammer and off he went (as of now he already sold his first sword made from old Volga springs for quite a nice price). Then I decided – I’ll become a blacksmith/bladesmith too. I start to make knives and other things with blades – daggers, swords, scimitars, axes, you name it. 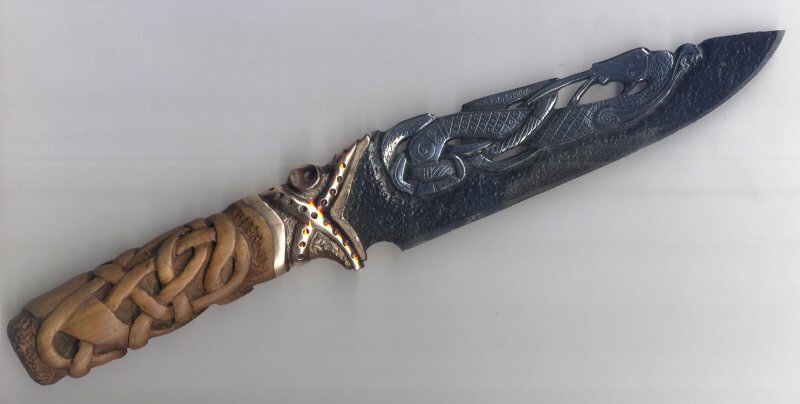 Especially I want to do Damascus style blades. I know they’re not easy to do (well), but I have the time. I’ll start with knives, of course. 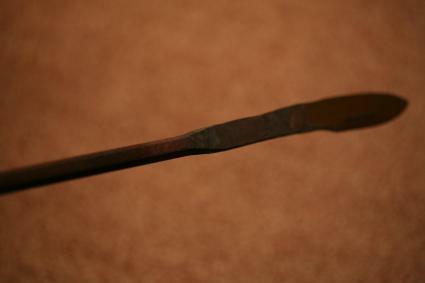 Here’s a picture of my very first try to make a knife blade. It is far from being finished and being perfect, but it might give some idea what will the results be in the future. I’ll keep you updated with my trials in the workshop. In the future I plan from time to time give away knives that I’ve made, so be sure to check my ramblings.